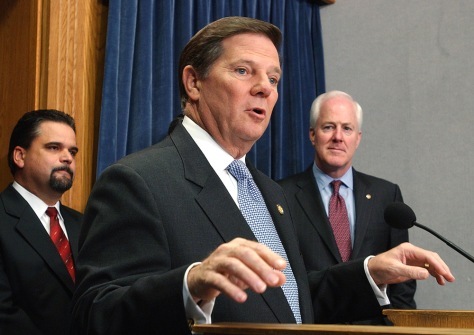 House Majority Leader Tom DeLay, R-Texas, discusses the Supreme Court decision on property rights during a news conference Thursday on Capitol Hill. He is joined by, at left, Rep. Richard Pombo, R-Calif., and, at right,Sen. John Cornyn, R-Texas.